"Gordie" Duane "1997 Local Hero & 2011 Honor Roll"
PHOTO: Gordie's 3 stringer balsa board make from Navy life rafts. Courtesy of Gordie Archive. PHOTO: Gordie Duanae, Randy Lewis and John Boozer. Courtesy of Gordie Archive. PHOTO: Lloyd Murray, Gordie and Pete Siracusa. Courtesy Gordie Archive. 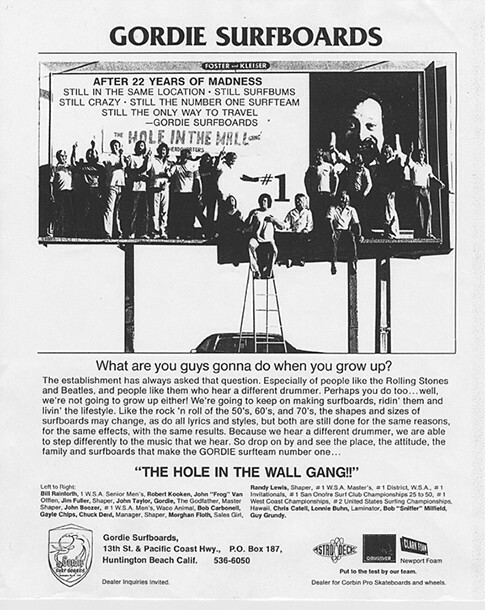 PHOTO: Gordie advertisement with "The Hole in the Wall Gang" sitting on billboard. Courtesy Gordie Archive. PHOTO: Gordie Duane, early years. Courtesy Gordie Archive. Gordie passed away on July 27th, 2011, just a few days before he ws inducted into the Surfing Walk of Fame for Honor Roll with the Hole in the Wall Gang. 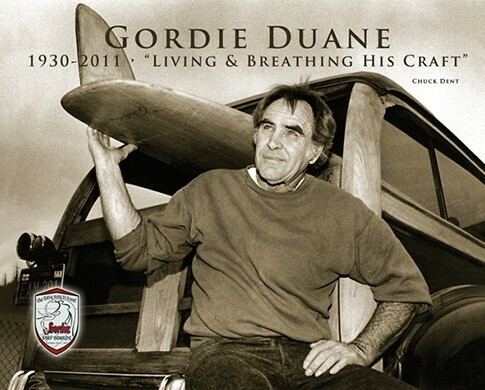 Gordon "Gordie" Duane belongs to a group of talented shapers in the 50's such as Greg Noll, Hobie Alter, Hap Jacobs, Renny Yate, Johnny Rice and his good friend Dale Velzy. Gordie started out by learning to work with wood as cabinet maker at his uncle's cabinet shop where he learned the appreciation of quality and craftsmanship. At age 20, in 1950 Gordie joined the Navy and was stationed at Pearl Harbor Hawaii. 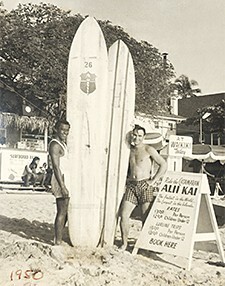 Soon he began to learn to surf at Waikiki and Queens reef where he met the Duke and his brothers, Rabbit Kakai and Abel Gomes. Abel helped Gordie make his first surfboard from surplus Balsa wood from Navy life rafts. Gordie sliced and laminated the balsa wood into a blank with 3 redwood stringers. With his woodworking knowledge and the help of Able, his first creation was near perfect and rode great. This was the beginning of his love for surfing and surfboard shaping. PHOTO: Gordie Duane high school picture. Courtesy of Gordie Archive. 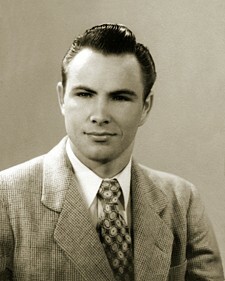 After his Navy days, Gordie eventually relocated to Huntington Beach, California where he continued to shape balsa wood boards in his parents garage. At one time, he had a shop near the well know custom car creator George Barris, where Gordie gained inspiration. Later he rented 4 rooms under the pier where he set up his first surfboard shop. It became a hang out spot during the day and a party atmosphere at night. Many of the locals would ditch school and would go surfing and then hang out at the Gordie Shop afterwards. The city passed a "no surfing" after 10am ordinance to try to detour the kids from ditching classes. Gordie became the first person for breaking the ordinance and was arrested. 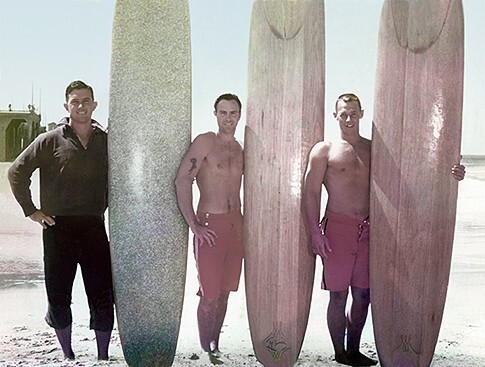 It's estimated that Gordie glued, shaped and glassed over 6,000 balsa wood surfboards. Once the urethane blanks were introduced, Gordie had the problem of having the blank bow while trying to shape it. So he took a blank, cut it in half and re-glued it together and put a wood stringer down the center and used inner tube bands to hold it together until the glue dried. This method became the norm for producing surfboard blanks. The Gordie first logo was created by Don Tiece who at the time was an art director for Knott's Berry Farm. The logo was made up of circles similar to the Michelin Man, which was dubbed "circle man". 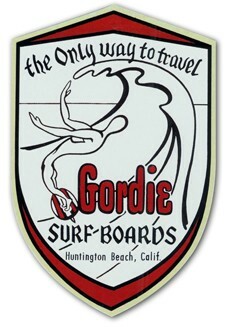 In around 1958 the logo evolved to what became the famous Gordie shield logo featuring a free spirited man inside a wave with the tag line, "The Only Way to Travel". This logo was considered very avant garde for the 50's. PHOTO: Gordie Duane in shaping room. Photo courtesy of Sheree, Gordie's daughter. 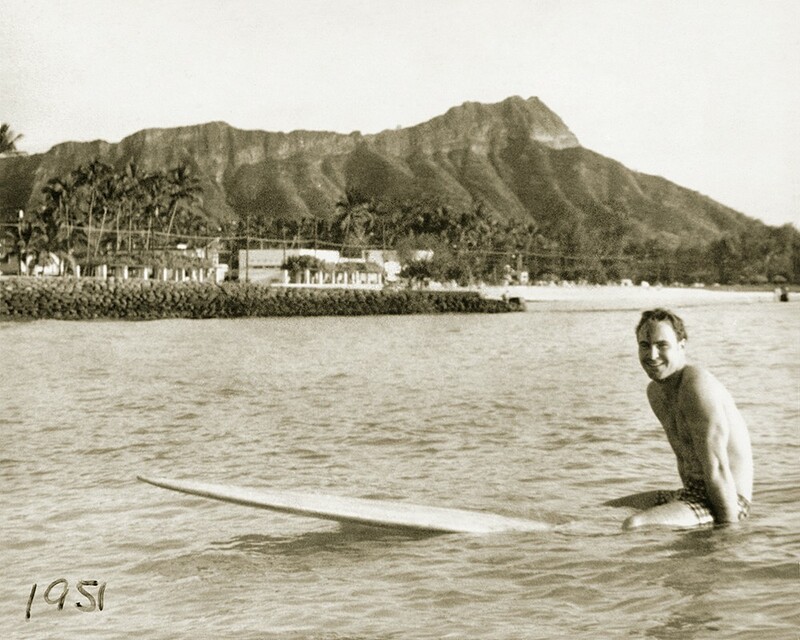 PHOTO: Gordie in Waikiki in 1950 at the Alii Kai. Photo courtesy of Gordie Archive. The surf was always much bigger at the Huntington Beach Pier and a lot of balsa boards broke in half which kept Gordie busy. In 1952, Gordie developed the first fin box which the fin would release when it had enough pressure on it such as catching it on the pier pilings or riding it up to the shoreline. In 1959 Gordie was out of town visiting his good friend Rennie Yater. 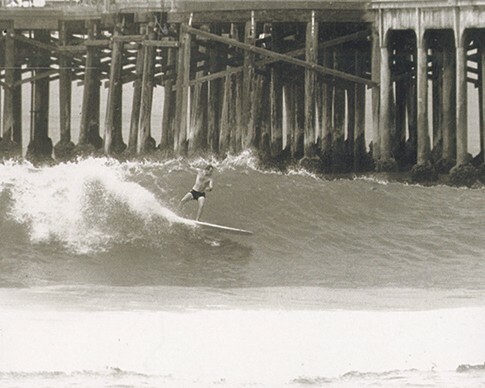 During his leave, a fire erupted under the pier and Gordie lost over 100 surfboards. This lead to the lost of his lease under the pier. Long time friend and team rider John "Frog" Van Oeffelen found an old oil well welding shop for rent at Pacific Coast Highway and 13th Street. The new shop was typical of surf shops at this time. You could only buy surfboards and maybe a t-shirt, not like today's surf shops. It has been said the Gordie built around 46,000 boards between 1956 and 1980. Gordie wore all the hats; CEO, advertising director, shaper, salesman, custodian, packer and shipper. But his product was always showed his superior craftsmanship even when he had several shapers working for him. His surfboard shapes were unique always with style and smooth flowing lines. His boards were designed for good experienced surfers, not beginners. He had several premium shapers, Mike Oday, Larry Felker, Del Cannon, Don Stuart, Bruce Jones, Steve Boehne, Jim Fuller and Randy Lewis. The 70's was fun time for Gordie and The Hole in the Wall Gang. The members paid for their own team expenses, but Gordie let the team hang out at the shop. The teams name was created from the drainage hole in the retaining wall hold the sea cliff across the street from the shop. The team was a group of seasoned Huntington Beach surfers who didn't enter the regular contest circuit. But the group surf hot and partied hard and followed the Gordie tradition of non conformity. In 1980 Gordie lost his lease at PCH and 13th Street when the estate sold the the property to developers. 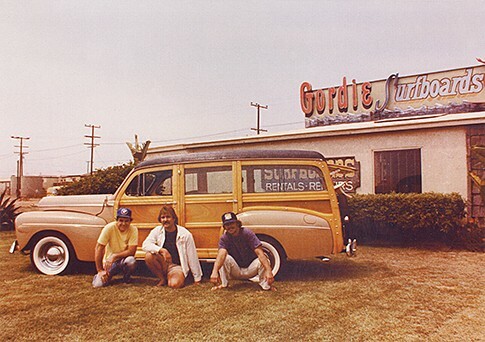 This ended an era but Gordie's shapers continue create and are licensed to make Gordie Surfboards with his brand. 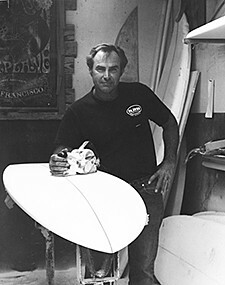 PHILOSOPHY: Gordie believe in three things for creating a surfboard. First it should be stylish and look good. Second it should function exceptional in the water. And finally it should be the highest quality possible. Gordie was know for his unique surfboard shapes and as a superb craftsmanship. 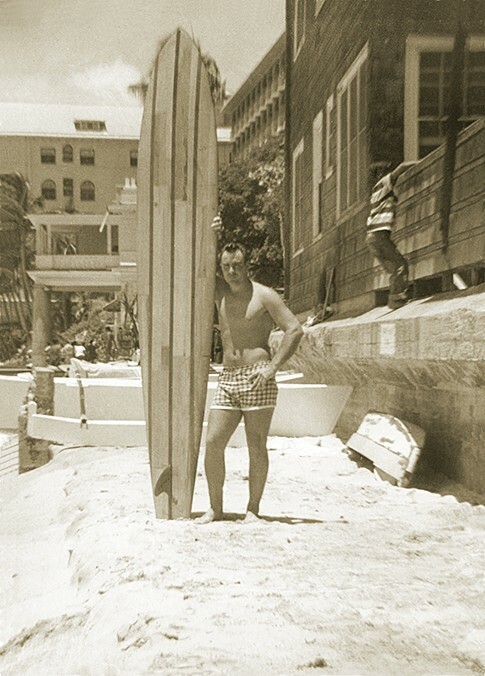 PHOTO: Gordie Waikiki 1951. Courtesy of Gordie Archive.